Chapit uses voice recognition to work out whether to turn on the kettle or record Eastenders. 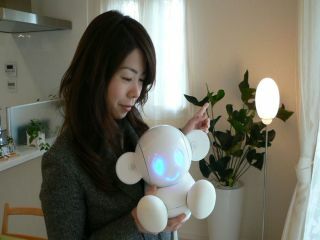 Japanese firm RayTron isn't one we've heard much about but that could change if its domestic robot, cutely named Chapit , gets to take over the nation's home entertainments as planned. The ¥200,000 (£879) droid should be available to buy next year but is already on view in a showroom at a high-tech model housing development called Napia in Osaka. Rather than showing off like one of those attention-seeking somersaulting robots , Chapit limits itself to sitting still and listening carefully. That's because the machine's mission in (virtual) life is to hook up to domestic electronics, including TV, video players, internet connections, lights and even heating, to act as a voice-controlled interface for the residents of the house. Demonstrations have already shown the robot switching TV channels, dimming lights and setting up videophone calls in response to the spoken commands of sofa-bound users. RayTron says it hopes to have Chapit recognising up to 10,000 words by the time it's ready for market. Sadly, for anyone outside the company's homeland, those words are likely to be only in Japanese.